Danielle Dutton is the author of Attempts at a Life and S P R A W L, forthcoming in August from Siglio (sigliopress.com). She is the book designer at Dalkey Archive Press and editor of Dorothy, a publishing project. In the eighth installment in BOMB’s Fiction for Driving Across America series, Dannielle Dutton reads an excerpt from her novel S P R A W L , published by Siglio Press, which appeared in the Summer Issue #112 of BOMB’s literary supplement, First Proof . 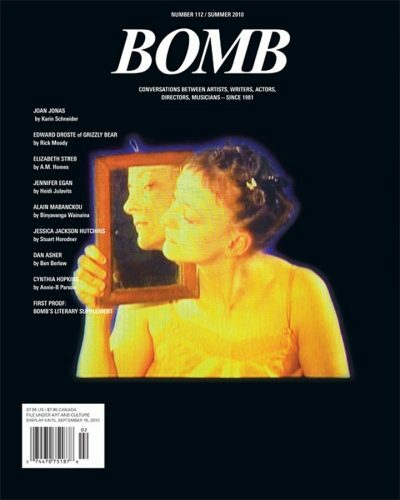 Featuring interviews with Dan Asher, Elizabeth Streb and A.M Homes, Jessica Jackson Hutchins, Sebastiaan Bremer and Shoshana Dentz, Alain Mabanckou and Binyavanga Wainaina, Jennifer Egan, Edward Droste, Cynthia Hopkins, and Joan Jonas.